A decapitated dolphin was discovered on a Lantau beach this week, just days after dolphin meat was found on sale at a Zhuhai market. A local resident, Ms Ho, found the body on the beach behind the Heung Yee Kuk school in Mui Wo and contacted 1823, HKET reported Monday. Another dolphin carcass had been discovered on the beach several months ago. Photos posted on Wechat and picked up by Hong Kong and mainland media last week showed a Zhuhai street stall selling dolphin meat for 20 yuan a kilo, sparking an outcry from mainland netizens and conservationists. The Zhuhai authorities posted photos online showing two middle-aged men cutting up what appeared to be Chinese white dolphin, which is found in waters around Lantau and the lower Pearl River. 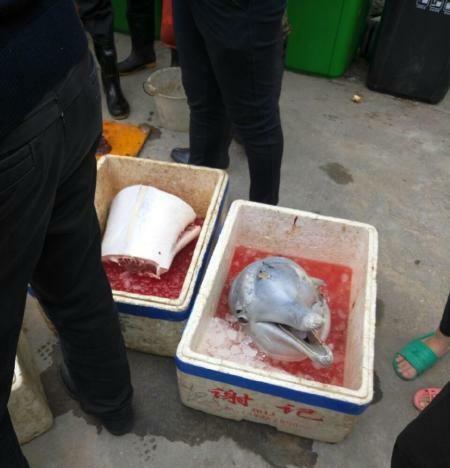 The photos show the two men next to 3 plastic containers, separately with dolphin heads, dolphin body, body parts and blood (further reporting in Chinese here). Experts who viewed the photos say that, judging by the colour and head size, the animal on sale was a young Chinese white dolphin. Trade and slaughter of dolphins is banned under the CITES treaty. Three men were taken in for questioning on March 31 and an investigation is underway.